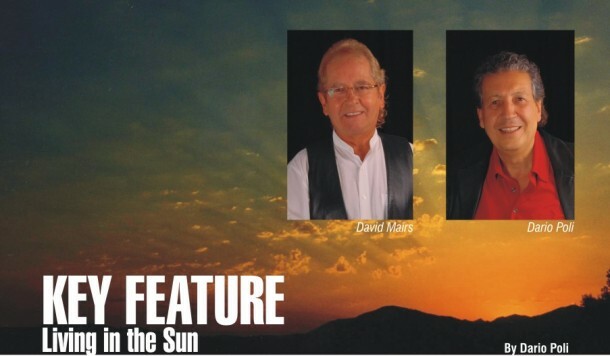 Key Feature “Living in the Sun” By Dario Poli | Marbella Marbella – Adelante! I was driving along the coast road from Fuengirola to Marbella, the sun was shinning with a brilliant intensity I had not seen for some time after all the rain we have had recently. Going past the wide bend before la Cala, from time to time my eyes could pick out the serene blue sea stretching ahead of me with images of light playing and dancing joyfully on the surface of some small waves gently coming in shore. Above could be seen hundreds of white and coloured houses dotted around the hillsides surrounded by a colourful display of flowers. This visual feast in front of my eyes, took me miles away from the negative and concerned thoughts in my mind, as I had been pondering on the recent horrendous earthquake, tsunami and nuclear disaster in Japan, the violent unrest in the Middle East, and the repercussions from the financial crisis still dominating much of the media and obsessing many of us. Seeing this wondrous display of nature’s finest assets, I began to feel lighter in spirit and my little problems and concerns vanished, as I realized how lucky we are to be in this beautiful and spectacular part of the world as well as living in the sun. My reverie was pleasantly disturbed, when the striking mountain of La Concha came into view providing a breathtaking backdrop for the town of Marbella and environs. Wherever you are in or around the beautiful town of Marbella, this mountain is hard to miss. From its summit, a visitor can look down on Marbella and the glamorous port of Puerto Banus and far beyond, with the blue shimmering Mediterranean Sea below spreading her majestic presence as far as the eye can see, invitingly casting her spell upon all who dare gaze upon her. And in her embrace, lies Marbella with its abundance of flowers and orange trees, with winding intimate streets where one discovers the most exclusive shops and restaurants. It’s perfect microclimate makes Marbella unique, enjoying 320 days of sunshine per year. I wrote the music and David Mairs the excellent lyrics, and we jointly produced the song in David’s Davlin Studio in Fuengirola. It’s part of a number of new songs for a CD aptly etitled Living in the Sun, which brings out the best of our feelings for this area and to further promote it, following on from my first campaign song “Marbella Marbella” that received considerable international publicity and support over the last two years, not only on the Costa del Sol but also abroad. David and I also produced the song “Corazón” and we are happy to know that it was chosen by the International charity, “The Children for Peace Onlus”, based in Rome, and whose President is Debbi Mace and Vice-President Lamia Khashoggi. We hope the readers of this excellent magazine will have the opportunity to hear and enjoy “Living in the Sun” as well as the marvellous video created for us by talented Martyn Wood www.smithwoodproductions.com and experience the joys and lifestyle of those of us lucky enough to live here.